Close Encounters with the Night Kind: Welcome Romance Hoppers!! And now for our special guest Kiki Howell. Kiki has written up a little Halloween post to share with all my readers and has graciously offered up a choice of one of her titles!! 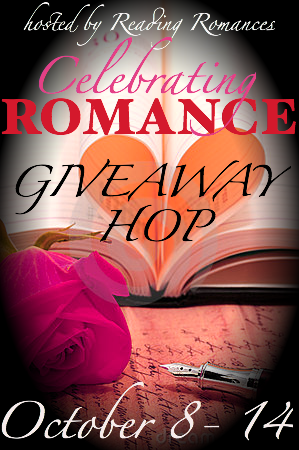 So stay tuned for all the information on how to enter in this great giveaway! Take it away Kiki!!! Then, last year, I did some more Samhain research, and created a story called “Samhain’s Visitor” where a Samhain ritual brought back a bit of a vengeful or angry ghost. Below I am sharing an excerpt because I feel it is very detailed about the Samhain ritual if you are curious about one. This year though, for Halloween, still combining my witches and ghosts, I have a witch trying to connect and help a ghost in a movie theatre to cross-over. This again was inspired by a real life place, a haunted theatre in my town. The legend tells of a woman who killed herself in the theatre after seeing the man she loved with another woman. Rumor has it they can’t play scary movies in theatre two or she messes with the working of the equipment. They have supposedly even had the film reel (when they still used them) catch fire. That was all I needed to hear to write my story, “Midnight Showing” which will release in late October this year in the Wicked and Wanton All Hallow’s Eve Anthology from Naughty Nights Press. 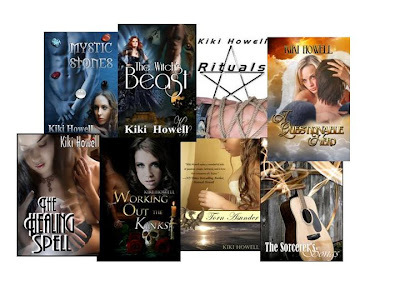 Of course, outside of Halloween or Samhain based stories, I do write paranormal or pagan stories all year long which include mostly witches, but also the occasional vampire or werewolf or I’ve even ventured into the whole angel and demon realm this year. So you see, it is Halloween, or at least the spirit of it, which is alive and well, in my mind, almost every day of the year. 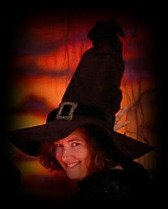 I love the decorations, love the movies, love having Witch’s Gorp with my family as we watch them, and will probably compose a few Halloween themed stories for 2012, as I have already contracted one! Looking around her, the room was all decked out for the holiday. Her altar candles were orange, black, white and gold. Orange represented the fiery autumn leaves adorning the land this time of year, while the gold stood for the moon and the sun. The other two were for absorbing and sending out energy. Stones like black obsidian, amber and garnet she had chosen each for their special meanings like truth and a positive attitude just like the herbs lying among them. Her favorites on this night were mugwort for divination and rosemary for remembrance. Her cauldron with the black votive candle caught her eye. It was to be used for petition magick, but she sighed, knowing she was in no frame of mind to write out resolutions just yet. Falling into a cross-legged position before it all, she closed her eyes blocking out the goofy jack-o-lantern smiling at her from the window seat. She took several slow deep breaths, forcing the air back out of her lungs each time. She pushed the still obscure thoughts that kept badgering her aside, trying to clear her mind. She visualized them as black smoke inside her, and forced them to move down her body, out her feet and into the cauldron. Yet, her heart thudded in her chest making it ache regardless of these attempts. Something was coming; she could feel the weight of it on her shoulders. However, even after finding no indications to what it was in her meditation time, she felt compelled to go on with tonight’s planned activities. Maybe, that was her answer. She was to move forward. It was an opportunity not to be missed. It was a day to commune with the dead, to celebrate the cycles of life. Sarah had spent the last month studying her genealogy, gaining names and information to hold her first ever mute supper, a silent meal where invited guests were from across the veil. The meal would grant her the opportunity to connect with her deceased ancestors in an attempt to gather some ancient knowledge from those who went before her. The table was set for it in the room, in her sacred space, with the tablecloth and all the dinner wear black as the ritual called for. A white candle was at the head of the table at her place with black candles set at the other table settings for the dead. She had handwritten prayers for each particular ancestor she was going to call upon. Looking over it all, she placed a quivering hand over her eyes. The sounds of the evening, people in the street and the hum of the street lights, seemed to disappear. Dizzy, she held onto the back of her chair and tried to find a sense of calm. With none to be had, she grimaced at her compulsion to move forward regardless. The feeling was now viable, moving her forward, unable to be ignored. With a nervous anticipation, she continued knowing with every fiber of her being it was something she needed to do. It was something more than a premonition. Something big would come of tonight. She was sure of it. Her role she prayed she would figure out as she went, that the spirits would guide her. Her chosen meal was a simple one. Laying it out on the table, she was impressed with the way it had turned out. The small roast, pumpkin bread and mulled cider were all done to perfection. Once her prayers were said and the food served to her unseen visitors, she ate silently. Not hungry at all, she chewed with slow, methodical bites. The weight on her chest grew heaver, waiting for that something to happen. As she struggled to swallow, she knew, somehow, that tonight this ritual meant a significant change for her. Trickles of this feeling had been coming to her for weeks, increasing more and more in the past few days. Confident she had bridged the web that linked her to her kindred spirits in her family line, she waited, eyes darting from plate to plate telling herself to be patient. Time seemed to drag, though, and her breaths became shaky. Eventually, she found herself fighting to keep her mind calm, to listen. Finally, in her head a voice, bright and cheery, spoke. She knew it was not her own self-talk, but that of someone she had reached. I could not stop him. He does not come for you. Be strong, my girl. Listen to the voices inside of you. The one you need will save you. Have no fear. Despite the smooth beauty of voice, it spoke words that carried an abrupt message of warning. The voice was so clear in her head, that she looked around the room expecting to see someone, something. Yet, nothing appeared. Nothing was there but a distinct chill to the air, which had not been before. She shivered, and listened for more, but nothing came. It was a strange message to get from beyond, but she had never known them before in any ritual to be all that clear. Cryptic was more like it most of the time. She would not doubt the validity of it. The kindred spirit had calmed the erratic beats of her heart, and her shoulders dropped. But, the message had accelerated her breathing. She looked around the room, moving nothing but her eyes. The candles went out. Darkness flooded her senses drowning her in a fear as chilling as the breeze in the room which flicked at her hair. A sweat broke out on her neck despite it as she screamed and scooted away from whatever had lightly touched her back with frozen fingers. Her skin was crawling. “It is only your imagination, Sarah,” she said out loud to try to convince herself and anyone else who might be there that nothing odd was happening, that she was alone. In response, the air stopped moving. The cold increased, sinking into her bones. It made the outside wall by the window feel warm when she scooted to press her back against the security of knowing nothing else could then be there. She waited for her eyes to adjust, only to close them when the shadows in the room became more defined and moved. Two deep breaths later, she opened her eyes again as she yanked on the curtain, hoping the slight light from the half moon would dispel whatever lurked whether it was a figment of her mind or not. A shadowy image trembled in the middle of the room above the table. Anger, arid and cutting, emanated from it, causing her head to physically ache. It moved closer to her, just inches from her face. She didn’t move, didn’t dare breathe. She could feel it examining her. It took on a more human-like shape, stilled. A light movement of the air went over her face as if it breathed too. The scent of woods, of horses, of old country air permeated her city dwelling. Curiosity mingled with her terror as she took tiny breaths into her lungs. They burnt as if the room was really filled with smoke. She gulped despite her dry mouth and throat, wincing from the foolish attempt to appease herself. Biting her bottom lip, she wrapped her arms around her legs and pressed her back harder against the wall, head to tailbone. Each small movement had been taken slow, deliberately. A cry again split the silence, only this time it was more like a scream although hollow, bereft of real air to make the sound. The bottom of the curtain she was still holding between the tips of her fingers was ripped from her grasp when the breeze picked up again. It spun around the edges of the room, this time rattling everything not bolted down. The air became so cold she thought her heart would just stop beating from the shock of it. Her eyes burned and grew teary. A presence larger, fuller than any she had ever encountered in her rituals before filled the tiny space. A shaking glass fell over, clinking against a plate and silverware. She looked at it, expecting the glass to then be thrown at her, but it came to a rest by a hunk of food. “Leave her be. She is not your Catherine anymore,” the sweet voice from her head spoke audibly from out of thin air. It originated from above her head though, currently. She felt the protection, a soothing gentle hug of those who came before her. Then everything fell silent. In her gut, she knew it was only the calm before the storm. As you can read, Kiki is packed full of talent! She has offered up to one lucky commenter a choice of one of her releases! Here are just a few samples!! These aren't all of them, this is just a tease! LOL! So how do you enter to win this great prize? Simple! Make sure you are a GFC follower and leave a comment with your email address! Thank you for stopping by and good luck in this giveaway and the rest of them below!!! Awesome excerpt. Love Halloween and all it's traditions. Really don''t like Horror movies anymore but I'm a sucker for the reads. Thanks for the opportunity. I look forward to reading one of your stories. :) GFC name is Lucky47. I love everything about Halloween except for haunted houses! I scream like a little girl whenever I try to go through one! Happy Halloween! Love this time of year. Thanks for introducing another great author through the blog hop! I LOVE scary movies. My two teenage daughters and I cuddle on the couch and watch one at least once a month! Thanks so much for the giveaway. I'm already a GFC follower, and I "liked" Kiki's FB page. I love scary stories. Thanks for letting me know about Kiki and thank you for the giveaway! GFC Krystal Larson edysicecreamlover18@gmailDOTcom I really liked the excerpt, thank you very much for the chance to win! Thanks for the giveaway. I love Halloween it's so much fun seeing how the kids dress up and I love to see everyone's decorations.